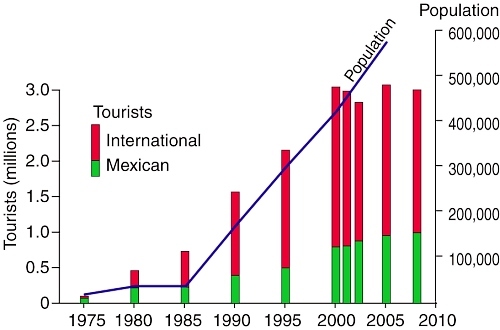 The table shows the number of tourists (national and international) visiting Cancún, Quintana Roo, Mexico, 2000-2013. From 2000 until 2011, tourist numbers fluctuated between 2.8 and 3.3 million. Since 2011, tourist numbers have risen sharply, to 3.6 million in 2012, 4.1 million in 2013 and a preliminary estimate of 4.3 million for 2014. 2007 3 004 802 2015 ? Cancún currently has more than 3000 condominium units and more than 35,000 hotel rooms. According to the first draft of the Programa de Desarrollo Urbano del Centro de Población Cancún 2014-2030, the city could have as many as 46,000 hotel rooms by 2030. This projection is well below the earlier estimate, made in 2013, of 64,000 rooms by 2030, but the new figure is claimed to be more in line with planned improvements to local water supply. The development of Cancún has often been criticized for paying insufficient attention to considerations of urban density, water supply and environmental impacts. The tourism and travel industry in Mexico accounts for about 13% of GDP. Speaking last month at the XI National Tourism Forum in the resort city of Cancún, Mexico’s Tourism Secretary Claudia Ruiz Massieu outlined the National Tourism Strategy 2013-2018. The new plan places more emphasis on increasing the average expenditures of tourists than on boosting total visitor numbers. It aims to revive the appeal and occupancy rates of existing destinations, rather than adding new resorts, and to diversify tourist attractions through programs such as Magic Towns and routes catering to specific interests such as Mexican cuisine. Other objectives include improved airline connectivity and simplified border crossing procedures. Tourist spending in Mexico rose to 12.72 billion dollars in 2012, 7.17% more than in 2011, but visitor numbers fell by about 1%. The World Tourism Organization ranked Mexico as the 13th most visited country in the world in 2012, a significant drop from the 10th place it had occupied for several years. Cancún has added a major tourist attraction with the opening last year of the Mayan Museum of Cancún in the city’s Hotel Zone. The museum replaces the former Mayan Museum closed in 2005 following damage from Hurricane Wilma. Built by the National Institute of Anthropology and History (INAH) at a cost of $15 million, the museum is that organization’s largest single project for some 30 years. It houses 3500 archaeological pieces, 350 of which are on permanent display, and is expected to attract up to a million visitors a year. Adjacent to the museum is the archaeological site of San Miguelito, the most important Mayan settlement on Cancún Island, also now open to the public. Cancún is Mexico’s premier tourist destination, attracting more than 3 million visitors a year. A recent Associated Press report by Mark Stevenson highlights the problems faced by the resort due to the erosion of its beaches. 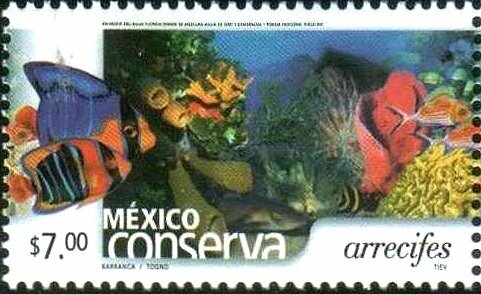 Cancún was developed on formerly uninhabited barrier islands on Mexico’s Caribbean coast. The islands were low-lying sand bars, held together by beach vines and the dense, interlocking roots of coastal mangroves. Hurricanes periodically swept over these small islands blowing loose sand towards the beaches on the mainland. Despite the occasional hurricane, the sandbars survived more or less unscathed until construction of Cancún, Mexico’s first purpose-built tourist resort, began in 1970. As Cancún has grown, so the damage from hurricanes has become more serious. Category 4 Wilma in 2005 was especially destructive. hotels have been built too close to the shore, and too many are high-rise buildings. High-rise hotels deflect some of the wind downwards towards the ground. These wind eddies can stir up any dry surface sand in a process known as deflation. hotels are too heavy. The sheer weight of high-rise hotels compacts the largely unconsolidated sediments beneath them, rendering the sediments less able to store or absorb excess water, and more liable to subsidence and structural problems. Extra weight also increases the load on slopes and leads to a higher incidence of slope failure. coastal mangroves have been destroyed, removing their ability to protect the shoreline during storm events. most beaches have been stripped of their original vegetation. The original beaches were protected by various adventitious vines which were quick to colonize bare sand. They would simultaneously help hold the sand in place, protecting it from wind action, and gradually add to the organic content of beaches to a point where they could support other, larger plants. Native vegetation has been mercilessly eradicated from Cancún’s beaches to create the tourism “ideal” of uninterrupted swathes of white sand. It also appears that hurricanes and other tropical storms have become more frequent in recent decades, perhaps as a consequence of global climate change. The situation has also been exacerbated by the gradually rising sea level. Sea level on this coast is rising at about 2.2 mm/y. Why have some of the efforts made to mitigate the beach erosion only made the situation even worse? 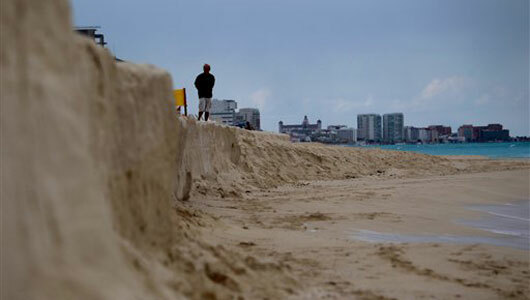 Following strong hurricanes (such as Wilma in 2005) Cancún has lost most of its beaches. The first attempt at beach restoration in 2006 cost 19 million dollars. In 2009, an even costlier (70 million dollar) beach restoration was carried out, using sand dredged from offshore. In one sense, the project was a resounding success. A new beach up to 60 meters wide, was created along some 10 km of coastline. However, this new beach came at a considerable ecological cost. The pumping of sand from offshore disturbed the seafloor and damaged sealife, including populations of octupus and sea cucumbers. Fine sediments raised by the pumping traveled in suspension to nearby coral reefs, where it also had deleterious impacts. In addition, the new beach is already being eroded away (some estimates are that up to 8% of the new sand has already been washed or blown away), so presumably if Cancún’s beaches are to be maintained in the future, beach restoration will have to become a regular event. One hotel erected a breakwater or groyne on its beach to retain all the sand being carried along the coast by the process of longshore drift. The Associate Press article ends with a wonderful story of how the beach in front of this particular hotel was cordoned off by marines last year on the grounds that it was stolen property. Tourism is one of Mexico’s major sources of revenue. 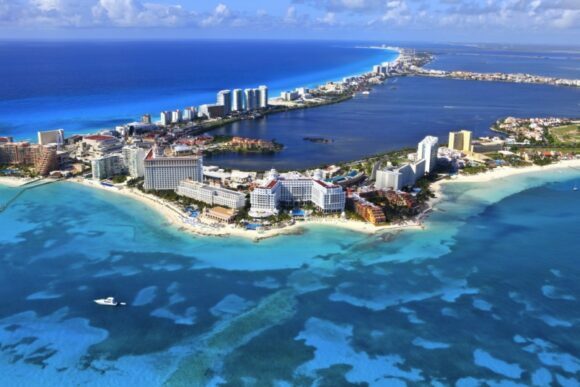 But tourism, especially high-rise mass tourism such as that characterized by Cancún, comes with a hefty price tag. Policy-makers need to decide whether this price tag, which will only rise further in the future as we continue to damage our natural environment, is really one that is worth the cost. Chapter 19 of Geo-Mexico: the geography and dynamics of modern Mexico looks in much more detail at Mexico’s purpose-built resorts as well as many other aspects of tourism, resorts and hotels in Mexico. Chapter 30 focuses on environmental issues and trends. Buy your copy today! 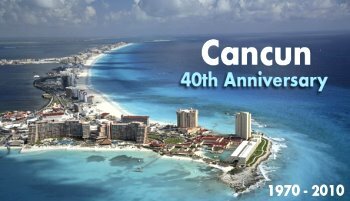 By 1975, Cancún had 1769 rooms in service; by 2008, it boasted about 150 hotels and more than 27,000 rooms. 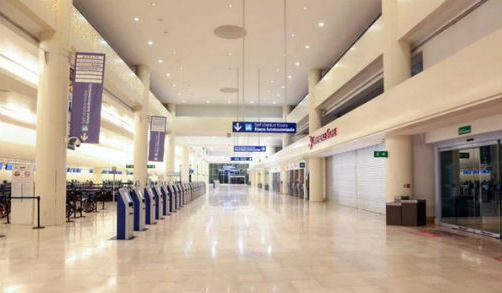 Second only to Mexico City, Cancún airport now handles 200 flights a day. The influx of people to Cancún has been especially dramatic. The city has had to cope with unprecedented growth rates as its population shot up from 30,000 in 1980 to 676,238 in 2010 (preliminary census figure) (see graph). Chapter 19 of Geo-Mexico: the geography and dynamics of modern Mexico, from which this extract is taken, looks in much more detail at Mexico’s purpose-built resorts as well as many other aspects of tourism, resorts and hotels in Mexico.